As a leading expert in cutting edge computer technology, Firma IT Solutions offers a variety of high-quality computer residential and commercial repair and maintenance services. 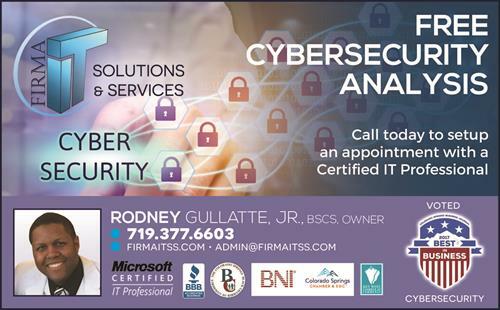 With headquarters in Key West, FL, and Colorado Springs, CO, our managed services and cybersecurity company has years of experience in computer network consulting, maintenance, IT systems management and cybersecurity services. We also provide powerful data recovery and backup services, reliable cyber-security protection, and valuable technical support. Voted best Best in Business 2017 #1 Cybersecurity Company by the Colorado Springs Business Journal.